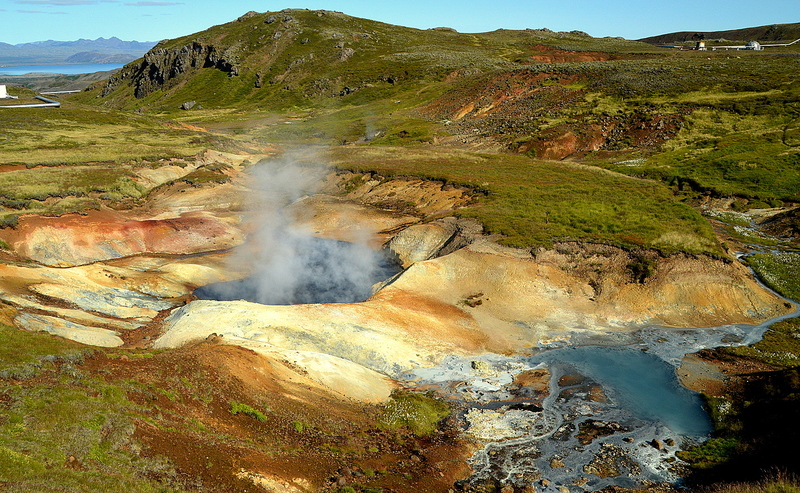 You don't have to drive far away from Reykjavík, Iceland's capital city, to find a very colourful geothermal area. I recently hiked through such an area, which will make you feel like you stepped into another world for a moment. 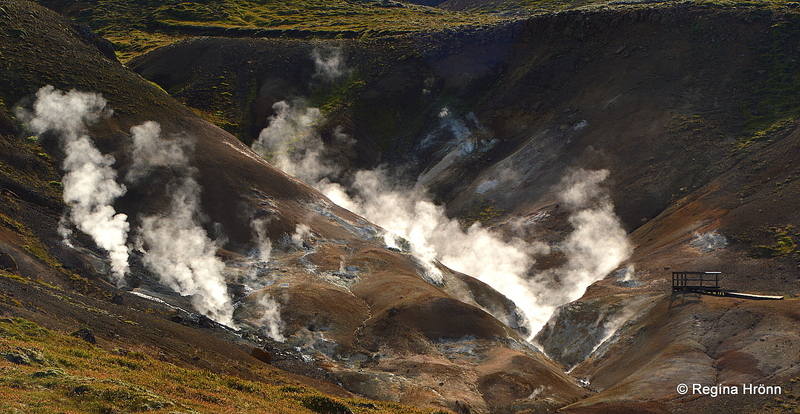 This beautiful geothermal area is located at Nesjavellir and belongs to the volcano Hengill. 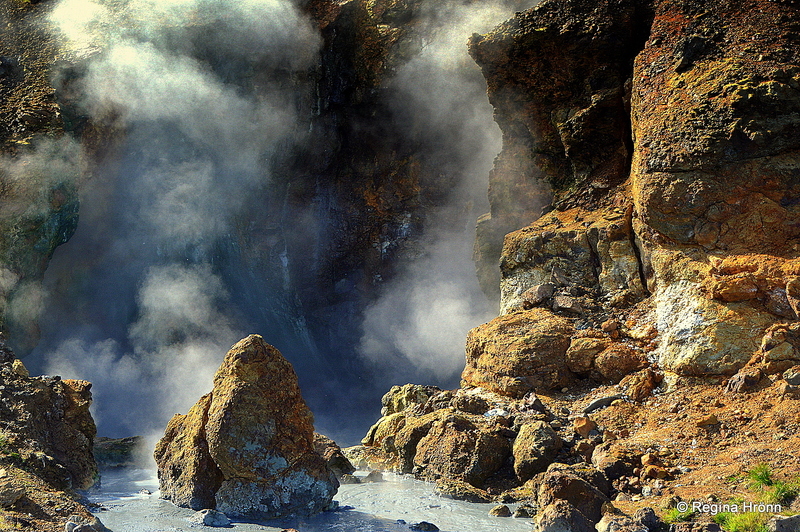 The volcano Hengill is amongst the largest high-temperature geothermal areas in Iceland, covering some 100 km2. The most popular part of this huge geothermal area is Reykjadalur valley, where you can actually bathe in a hot river! One of my most widely read travel-blogs is the one on Reykjadalur, and I understand why as it is such a fantastic place to visit. But the area I am going to show you in this travel-blog is called Nesjalaugar hot springs and Köldulaugar hot springs. Here you will find many interesting hiking trails. We parked the car at the car park by the view-platform overlooking Lake Þingvallavatn and walked down the closed-off gravel road to the first geothermal area, Nesjalaugar hot springs. Before we reached the educational path by Nesjalaugar, we checked out a bubbling sound we heard from the road. It came from a hissing and bubbling hot spring inside a cave! It is not safe to walk up to it, so we admired it from a distance. What an absolutely amazing sight this was, this was for sure like something out of an adventure film - why had I never seen this hot spring before? I took a video of the hot spring on my mobile phone. It is not of the best quality, but I hope it gives you a general idea of the grandeur of this hot spring, as in my video you can hear the power of the water bubbling and boiling. I have not been able to find a name for this hot spring. I have asked around and nobody seems to know its name. It is so special that it must have a name, but remains nameless in this travel-blog until further notice. Just below this huge geothermal spring, I saw some sheep grazing by the blue geothermal river. They were actually drinking from the river, so I guess it must be safe for them. 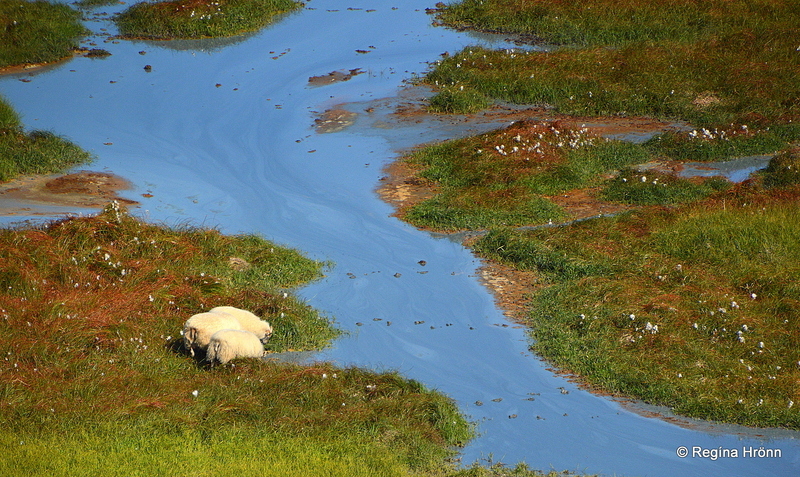 The river is filled with geothermal matter, that is why it has this "strange" blue colour. I know that sheep crave salt and stubbornly stand on our roads when they are licking off the salt, so there must be something in the geothermal water which they like, as I saw many more sheep in this area. After exploring the geothermal spring below the road and the geothermal area above the road we followed the educational path of the geothermal area Nesjalaugar. 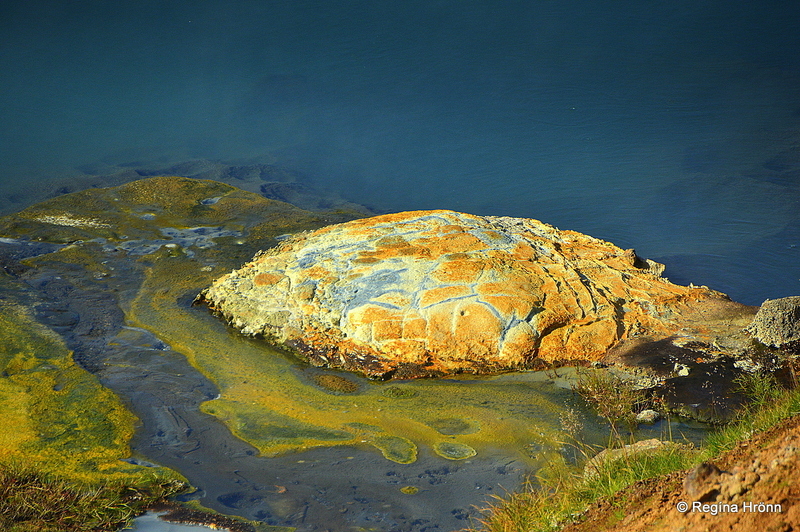 This is as colourful as these areas get, here you can see extremely vivid geothermal colours, ranging from every shade of brown, yellow, orange to the brightest red colours - complementing the characteristic blue colour of the geothermal water. Geothermal areas are at their most beautiful in the sunshine, so I chose a sunny day to visit this area. I had joined a helicopter tour on a beautiful sunny day to another geothermal area also belonging to the Hengill area, Ölfusvatnslaugar - also called Hagavíkurlaugar, and was determined to see the rest of it in the sunshine. The distance from the parking lot to Nesjalaugar is 1.5 km and the educational path through Nesjalaugar geothermal area is 0.5 km long, the sign said. So we were now 2 km into our hike. The distance to Köldulaugar geothermal area was only 1.2 km according to the sign. I wanted to see more of this area and couldn't stop taking photos of the beautiful nature surrounding me. After visiting the colourful geothermal area of Nesjalaugar, we followed the path uphill and into a beautiful gorge, Köldulaugagil, where we followed a creek and passed a small waterfall. The trail is marked with sticks so you will not get lost in this area, but on the day we did this hike there was absolutely nobody around. Steam was coming from the hills around us and all around us small white butterflies fluttered; it was such a serene and pretty sight. I don't often see so many butterflies on my travels in my country, but I guess that not many people disturb them here, so they are at peace. After hiking through the gorge we reached the Köldulaugar geothermal area. Köldulaugar means Cold pools, although the geothermal area consists almost solely of fumaroles and solfataras - mud springs. An observation platform has been erected at Köldulaugar, where you can watch the columns of steam rising from the boiling and bubbling earth. Let's always follow the paths and be extra careful here in these geothermal areas. Do not wander off from the paths as one false step can make the thin crust of the geothermal areas break and beneath is boiling water! I know how tempting this is to go a little bit closer to get the perfect photo, but it is not safe. Way too often people have been severely burnt when they have wandered off the paths and stepped on what seemed to be solid ground. Way, way too often, so let's be very careful here! Be on the lookout for lava trolls along the trail; I saw several lava trolls on the way! We have a myriad of folklore in Iceland connected to the trolls and further below in this travel-blog I tell you about the woman who turned into a troll and scared travellers in this area. At Köldulaugar I continued walking and reached the Nesjavellir geothermal plant. 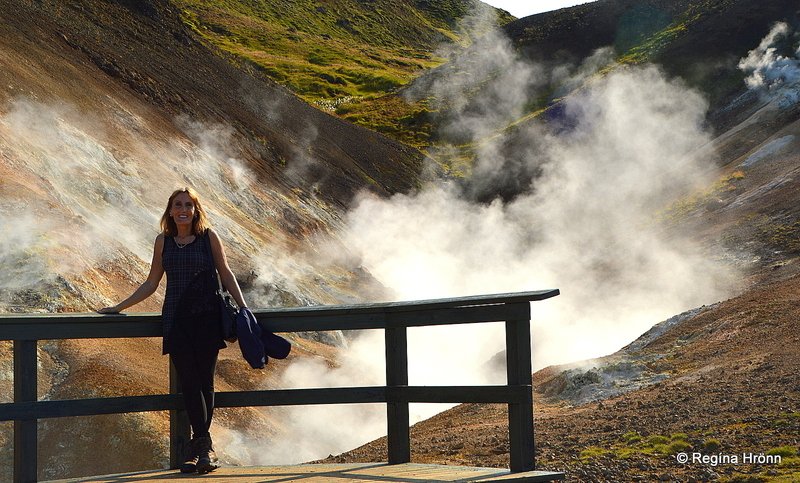 My husband returned back for the car and picked me up by the end of the hike a little further than the geothermal plant. In certain locations on this hike, you will notice some peculiar silver coloured round huts, but these huts mark the borehole. In my photo above you will see borehole number 10. Follow the gravel road for a short while and check out the many beautiful pieces of colourful lava by the road, blue, pink and orange in colour, very pretty. If you happen to be in this area in sunshine you will notice how the lava glistens in the sun. The lava is weathered though, but if you want to see beautiful lava colours and shiny lava then I would recommend a visit to the lava caves. Nesjavellir geothermal plant, which is the second largest power plant in Iceland, delivers some 1,800 litres of 85°C hot water per second and produces 120 MW of electrical power. It is owned by ON Power. The largest geothermal plant in Iceland is situated not far from here (some 11 km), Hellisheiðarvirkjun geothermal plant, which also belongs to the Hengill volcano area. The last eruption here took place some 2000 years ago when the youngest lava on Hellisheiði heath and Nesjavellir flowed. The lava field Nesjahraun flowed from the 30 km long lava fissure reaching from Þrengsli, Nesjavellir to Sandey in Lake Þingvallavatn. You will notice a couple of small craters on the last part of the hike through the Nesjahraun lava field. Lava fissures can also be seen by the end of the hike. To finish the hike you cross a bridge over a burning hot steaming river! The hike from Nesjalaugar geothermal area, according to the sign, is 3.9 km and the distance from Köldulaugagil gorge is 2.7 km. I had spent some 3.5 hours on this hike, not finishing the circle though as I didn't walk back to the observation platform, from which I started the hike. Add another half an hour or so for the return hike from here. Now drive down to road 360, Grafningsvegur road, and make a left turn for the Golden Circle, the most popular route in Iceland. Drive by Lake Þingvallavatn to the end of road 360 and turn right on road 36 for Þingvellir national park. Close to here is Mt. Dyrafjöll with some interesting hiking trails. If you have read my travel-blog on the Giantess Jóra in Jórukleif, then you will be familiar with the folklore of the terrible giantess at Mt. Dyrafjöll, who killed both men and animal travelling through this area. Fially, a young man was able to kill her after getting instructions from the Norwegian king. The way he killed her gave a name to the river at Þingvellir national park - Öxará river or Axe river. It is written in Þjóðsögur Jóns Árnasonar - the Folklore of Jón Árnason, which I refer to often in my travel-blog, that the Norwegian king told the young man to find Jóra by sunrise on Whitsunday and put an axe between her shoulders. And so he did. Jóra rolled down into a lake close by with the axe between her shoulders. The blade of the axe drifted up into the river, which was then named after the axe. And there, by Öxará river the Vikings founded their parliament Alþingi back in 930 AD. There are many more tales related to this area and on your way to Þingvellir national park, you will pass an elf-church on road 360, a church of the Icelandic elves, who live here in Iceland with us locals. "I was up on the hill in the north-west corner of the valley and was utterly surprised at what I saw. A large hill, which was supposed to be on the other side of the valley had all of a sudden disappeared. In its place, I saw a beautiful church. The church was open and I could see towards the altar of the church. The church was lit up and above the altar was a beautiful altarpiece. The colour of the inside of the church was powdery blue. I saw people coming to the church from all directions, some of them were riding and some were on foot. These people were of all age groups - from babies to decrepit old people who could barely walk. Some of them were dressed in somewhat cheap clothes, while others were dressed in glittery clothes - and the attire of some of the women was really fancy. The minister was very advanced in years, big and distinguished with a full beard down to his chest. He came from a farm close to the church, dressed in a robe and such walked to the church". Hafsteinn watched the ceremony, which was apparently the christening of two babies. The vision soon came to an end and the hill reappeared. Hafsteinn had a year earlier seen fancily dressed people walking on the frozen Lake Þingvallavatn heading for Botnadalur valley. Most likely on their way to service in the elf-church. To visit this area you can rent a car in Reykjavík and drive up to Nesjavellir observation platform in half an hour via Nesjavallavegur road no 435. By this road, you will notice big water pipes carrying hot water from Nesjavellir to the Greater Reykjavík Area. I found one guided tour which takes you on a Super Truck Adventure | Explore From Reykjavik to Hellisheiði, Hengill and Nesjavellir.